Cosmochoria, from Nate Schmold, features a naked cosmonaut (with a helmet) jetpacking through space and blasting away at aliens, all while planting seeds to restore the galaxy. 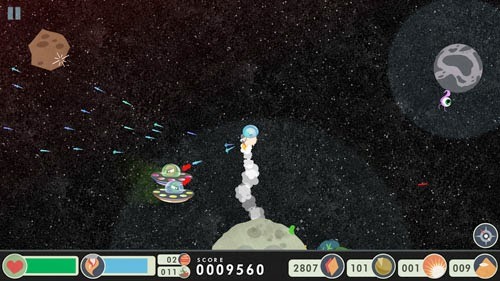 The cosmonaut is able to hop from planet to planet, destroying bad guys and bosses who are attempting to destroy him. Along the way, you plant seeds to grow plants, which in turn yield more seeds, and you can even build bases on planets to blast away at aliens while you work. The game features a procedurally generated galaxy and a shop system that allows you to upgrade your abilities. Cosmochoria has left Early Access and is now available for PC, Mac, and Linux via Steam, and to celebrate its full arrival, the game is 50% off.